I hope you're not tired of hearing about my master bath (since it was all I talked about last week), but I promised I'd give you a bigger view once it was put together a bit more. There's still more to do, but it's finally starting to come together. Yeeha!! Oh, and I should mention...I NEVER would have gone this direction with the bathroom if I had an intention of selling any time soon (ummm, blue-green vanities aren't exactly on most buyer's wish lists). But I know it will be easy to change if I do sell at some point, and for now it makes me happy...which is what matters right? and I need to replace the faucets. I'd like to add "feet" to the vanity too. And see? I really will be installing new faucets. I'm just waiting for the second faucet to arrive...you know because a smart person installs both at once....and I try to be smart and sensible every once in a while :-). They're the Delta Victorian faucet, and I bought them on Ebay. They retail for something like $200 and I about one for $65.00 and one for $35 (used but in perfect condition). The chandelier is actually a real chandelier (um...obviously...but I mean it's wired for electricity and bulbs and all that) that I found at an estate sale for $16. I sprayed it black and added candles and crystals. I hung it from a hook in the ceiling (with an anchor)and sewed a little cover for the chain. I found the shelf at a flea market and shopped the house for candles and other goodies to dress it up. The vintage bottle was my grandma's. She loved antiques as much as I do. And...one more BEFORE picture just for comparisons sake. The best part? I was able to give the bathroom a new look for very little money. I did the math, and between paint, faucets and accessories I spent about $250. Yes, I'd love to retile the floors, retile the tub surround, add a nice stone counter, etc....but for now, this bathroom feels soooo much better to me than it did before. I firmly believe that anyone can improve their surroundings regardless of the budget they have to work with. All it takes is a whole lot of creativity and a little elbow grease. Looks fabulous!!! I love the color of the cabs and I love the faucets!! Beautiful - the cabinet color is perfect! It looks great! have you thought about a little light for between the mirrors with a little linen shade or a mercury glass one? I love your taps, they are lovely and what a bargain! Looking really really nice, I love the cabinet color. Love how your bath is looking. I really like the touches of "sea glass aqua" color. How about a vase of some tall reeds or sea grass or twigs on the counter between the two mirrors? That's what I did and it looks great. Can't wait to see more. i think your blue-green cabinets could be a selling point! it all looks nice and on a smart budget too! My favorite is the painted cabinets. Looks great!! Hey AN. Just checking in and am amazed as usual with your new project. I think this color and application is just what your room needed. Does your blue bottle say Hoods on it? I have one just like it. Ditto the locker basket. Everything looks super! I love what you have done! The color is fabulous. You know so many people say neutral colors are better for resale but when I sold our old house, it was listed for all of 1 day before we had a buyer. I had calls for a month though and everyone that called told me they loved the colors, or the colors made the house stand out or be rememberable to them. We had a rustic red bedroom, bright lemon yellow kitchen, teal washroom with multicolor cabinets, little boy's blue room, and dd's striped room in orange, hot pink, and 3 shades of lime green. Sorry, I got off on a tangent. Just wanted to say you are really doing a great job! I think the blue-green cabinets look awesome. That bathroom is gorgeous. Did you paint the counters? I also have an award for you at my blog. I love your blog! What an eye for decorating you have! I love the color of the cabinets! Do you know what your wall color is...it is very soothing and relaxing! I L-O-V-E it! It turned out so great. I agree that *something* needs to go between the mirrors. You'll find something brilliant, I'm sure. I love it - very inspiring! The chandy is my fave! that looks soooo relaxing. great job! So PRETTY. I bet you go in just to stand there and look at it. Oh no, I do not get tired of seeing your master bathroom! You have created it so beautifully! Thanks for the inspiration!! Just stumbled across you somehow and I'm so glad I did - your bathroom (and entire blog) is just lovely. I'll be back to visit for sure!! Your bathroom looks great! Well done! I think your vanity looks awesome! Love, love, love the color. It really adds so much charm. Oh, and I think the 'feet' on the vanity would top everything off perfectly! Great job! Your bathroom is now so inviting and lovely! AnNicole -- this is gorgeous! GORG!! That light fixtures is freaking fantastic!! We need a closer shot of that, puhleeeeze?? Annicole - your bathroom looks beeeeeautiful! I love the apothecary jars! I love all the details. You did a fantastic remodeling job. It looks GREAT. Good job. I agree! It doesn't take a fortune to change things up for the better. You've done an outstanding job on that bathroom, so cozy & fresh feeling now. What a transformation! I love the blue cabinet. Great choice. You did a great job! That is so pretty! I love the cabinets! Amazing! The sink, faucets, cabinet color ... I love it all! Great job, it came out amazing. I love the color scheme. Looking to modernise your bathroom with some new and stylish Bathroom Mirrors.? Spacify has everything you need. Its looking fine, you can find more Sink Faucets here…..
Just found your blog! I love it. I'm new to blogging. I have one but it's not up and running exactly. You are so very talented!!! I could sit here all afternoon with a cup of tea and read and look and read and look...it's all so wonderful! 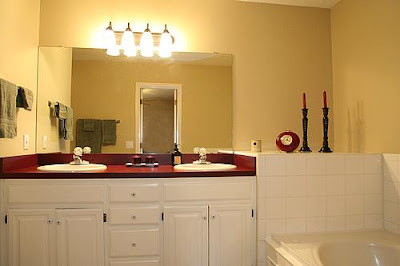 How did you change the bathroom counter top from red to the neutral?? Our home is a 1970 ranch that we are re-doing one wee step at a time! How to make a "Chandelabra"
Let's Play Pretend Shall We?